The microtubule network is a platform for organizing the cell. Microtubules are dynamic polymers of tubulin proteins that connect distant regions of the cell for transport and signaling. Mechanochemical enzymes, or motor proteins, bind and walk along microtubule tracks, generating force to move organelles, other cargoes, or the netwo﻿rk itself. Microtubule dysfunction is implicated in many diseases, including cancer, neuropathies, and viral pathogenesis; underscoring the importance of proper network function. We investigate the structure and function α- and β-tubulin proteins, which are the subunits of microtubules. Our goal is to understand how changes in the structure of α- and β-tubulins, which arise through evolution or mutations linked to disease, alter the functions of microtubule networks. We are particularly interested in the carboxy-terminal tail regions (CTTs) of α- and β-tubulins. These regions contain an abundance of negatively-charged residues thought to engage in electrostatic interactions on the microtubule surface. In addition, they are major sites of tubulin posttranslational modification and exhibit high sequence variation amongst tubulin isotypes in humans. We hypothesize that CTTs are regulatory modules for microtubule dynamics, motor trafficking, and network architecture. Dynein is an evolutionarily ancient ATPase the converts energy from ATP hydrolysis into directed motion along microtubules. Cells use dynein for diverse roles, including axonal transport, mitotic spindle assembly, MTOC positioning, and the formation and function of cilia and flagella. We investigate how cells regulate dynein activity in order to accomplish precise movement. Our goals are to understand the regulatory mechanisms that tune dynein for different roles and how mutations in dynein and its regulators contribute to disease. ​Mutations in tubulins and microtubule regulators cause specific defects in brain development, indicating unique requirements for the microtubule cytoskeleton in this context. How subunit mutations affect microtubule function in a manner that contributes to pathology is poorly understood, presenting a barrier to effective therapy. We seek to improve understanding of the molecularly complex environment of microtubule networks, with particular focus on the neuronal cytoskeleton, and provide novel insight into tubulin structure and function that will be important in a broad range of contexts. Drugs that alter microtubule dynamics are commonly used as frontline chemotherapeutics. Our current understanding is that these drugs kill dividing tumor cells by disrupting the formation of the mitotic spindle, eliciting a cell cycle checkpoint response that leads to apoptotic cell death. Despite prevalent use of microtubule poisons in cancer therapy, a major obstacle is the emergence of drug-resistant tumor cells. 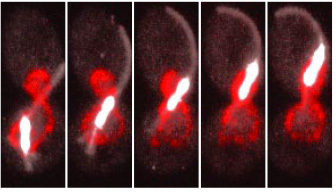 We are interested in how cells develop resistance to microtubule poisons. We are using yeast genetics and mammalian cell culture models to uncover pathways that permit evasion of drug-induced cell death. Our goal is to identify novel markers or targets that may optimize cancer therapy.